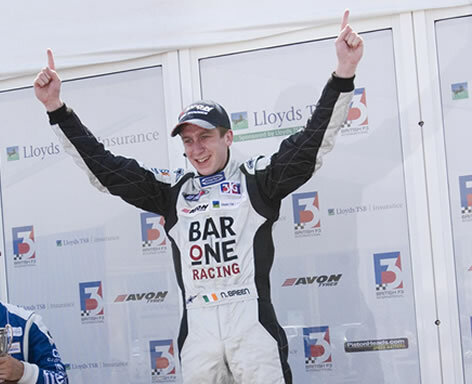 Niall Breen became the first Irishman to win a round of the Lloyds TSB Insurance British Formula 3 Championship in five years, when he won the seventh round of the prestigious series at Snetterton in Norfolk on Sunday. The last driver to win a round of the series was Clonakilty's Michael Keohane, who won the double-header at Donington Park in 2002. Keohane also raced for Carlin Motorsport at the time, and this year has been watching Breen's progress with interest, giving the 21-year old help and advice. Quietly-spoken Breen, the 2006 Formula BMW UK title holder, qualified second on the grid in the Bar One Racing Dallara Mercedes during Saturday morning's qualifying session at the Norfolk track, having been pipped by Atte Mustonen to pole position. At the start of the 30-minute race, Breen made a brilliant start and was in the lead by the end of the pit lane. From there he kept his cool throughout, despite being pressurised by Carlin team mates, Sam Bird and Alberto Valerio. As the trio began lapping back-markers with about six laps to go, Bird pulled alongside Breen at one point, but Niall maintained his line, out-braked Bird and stayed ahead to the finish, leading his team mates Bird and Valerio to a magnificent 1-2-3 for Carlin Motorsport at the end of the 28-lap event. Having suffered a slow puncture in qualifying for round eight of the series, Breen found himself down in a lowly 11th place with a lot of work to do. However, at the start of the race, he got the jump on Greg Mansell into 10th place and then on lap nine took Jonathan Kennard for ninth at the Esses. When Sebastian Hohenthal and Rudolfo Gonzales clashed, sending Gonzales off, Breen was up to eighth, moving up to seventh when Mustonen made a mistake. Marko Asmer won his fifth race from Valerio, Bird, Maro Engel, Stephen Jelley, Hohenthal and Breen. Breen's exceptional progress in British Formula 3 is all the more remarkable as it is only his third season in car racing. Niall now moves up to fourth place in the series with 67 points behind Asmer (126), Bird (78 ) and Jelley (77). The next two rounds are in Monza, Italy on June 23/24th.